The future health of a child is founded even during formation of his parents’ sexual cells. The prenatal development and childbirth also effect on health. That, which habits are followed by parents, what is their behavior during pregnancy and childbirth left an imprint on whole future life of a man. It’s not a secret for anybody what a negative impact on child’s health affects tobacco and alcohol. Wine spirits effect on reproductive cells of the parents, the fetus and are a reason of ill and weak progeny. And still there is a chance that the child will be born healthy. But in this case the environment will set its seal on a further development. The child being educated in an unhealthy and traumatic atmosphere is fated to lots of traumatic problems in future, which will interfere him to live up to the hilt. The drunkenness of parents never passes without a trace, and traumatizes the health or the psyche, or both of them. In this way, two main factors effect on a child health: psychosocial and biological. 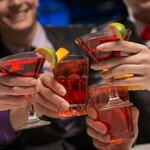 Alcohol can destroy the health and psyche of a human at any stage of development. This toxic substance causes lots of irreversible damages in organism, cripples a man. And if adult alcoholics doom themselves to the existence like this, so what is the quilt of their children? Let’s consider such actual problems as posterity’s diseases of alcohol-dependent parent and future children’s life of chronic alcoholics. Even many ages ago, when the medicine has not reached such results, as now, a famous scientist wrote, that drunkenness is a reason of children weakness and sickliness. And he was absolutely right. Nowadays, when the alcoholism is learned well, there were brought out lots of negative consequences of alcoholism, which were come out in their children. The pernicious influence of alcohol and its toxicant impact is difficult to underestimate. Actually, the alcohol can destroy the whole life of a child. Many studies show, that the most pernicious influence on a child makes a family alcoholism. Most scientists even think that the alcoholism is a family disease. Famous American discoverer Goodwin, who dedicating his life to studying of alcohol, asserted that it is impossible to be a heritable disease, despite of alcohol family history. The alcoholism is mostly caused not by the heredity, but exactly by wrong upbringing in a family. The negative impact on a child begins from a joining a drunk sperm and drunk ovule during the formation of a fetus. And if the father takes part just in a conceiving so the mother gestates a baby all 9 months. That is why for the health of a future baby is bad if his father drinks, but a mother’s drunkenness is hundred times worse. For example, it is already proved that every sixth child have being conceive in drunken condition, is born dead. There is even exists a special definition in Brazil – “the children of carnival”. Also the same phenomenon existed in an ancient mythology: the only defective and ugly god of Olympus, Hephaestus, was conceived by Zeus in a drunken condition. the diseases of leaver were found in more than 328 women and the same quantity suffered from diseases of urogenital system. Thus, more than 80 percentages of explored women suffered from different diseases and somatic disorders. Obviously, those women can’t have a full-fledged offspring and become good mothers. And this is considering, that there were explored the women of a childbearing age. Almost half of them begin to drink regularly in age of 20, the others were suffered from alcoholism from their childhood, and have got this dependence from their drunken relatives. What children are born from parents of alcoholics? Despite the fact that the direct inheritance of alcoholism is still not proved, the different deviations and pathologies are observed in most children from drunken families. These deviations of children development are not just dangerous for a health, but also can help appearance of alcohol dependence in future. It is a result of pathology in central nervous system, which appears in instability of mood, increased irritability and irascibility, emotional instability. If a child, who was born in a drunken family, tried an alcohol, so it will be difficult to refuse from it, because it improves his always bad mood and health, helps to forget about the problems. The situation is not better with uneducable children, which are often born in such families. Inherently, they are very exposed to outside influence; easily submit to the opinions of others; don’t have “brakes”. Such children easily fall under the negative influence of companies in the yard, begin to drink early and smoke, in order to be as everybody and do not differ, and become real alcoholics. The mothers, suffering from alcoholism of 2 or 3 stages, often bring into the world children with more serious disorders of the central nervous system: seizures and epilepsy. In the 19th century the French psychiatrist Morel has made great studies. He has investigated four generations of hereditary alcoholics and came to conclusion, that an alcohol is a reason of family degeneration. In the first generation of a drunken family there is a significant reduction of morals and in the fourth generation the children has suffered from mental deficiency and other pathologies. The influence of alcohol on a baby is many times more dangerous than on the adult. The same alcoholism in a tender age is developed faster and with heavier consequences. And the sooner the child develops position to alcohol drinks the worse it will be. 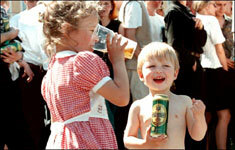 The alcoholism can appear even in infancy and be transmitted with mother milk. Moreover, some mothers, who don’t suffer from alcoholism, can give to a baby alcohol with food that the baby be calmer. For example, earlier the infants were given a bread crumb soaked in beer, because it had a calming and soporific effect on a baby. Very small babies are so susceptible to alcohol that it can penetrate to their organism even through the skin. There are known accidents in medicine when a little baby was made compresses and sponging-down with an alcohol and as a result he has suffered from severe poisoning by alcohol. During the school age the alcoholics’ children tired very much, often headaches, sleep disturbance, night terrors and nightmares. They are fearful, are constantly tense, emotionally unstable, and are often in a bad mood. 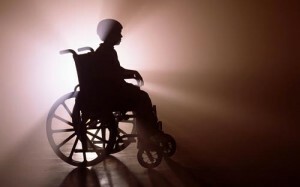 Many children suffer from physical disturbances. It is difficult for children from difficult families to concentrate on one thing; they often suffer from dementia of varying degrees of severity. That’s why it is difficult for them to study, communicate with fellows and to live a normal life. The children of alcoholics often are conflict, stubborn, don’t go for a contact, and are inclined for inadequate actions. Not infrequently they leave their houses in a young age, begin early consumption of alcoholic drinks and live unhealthy life. 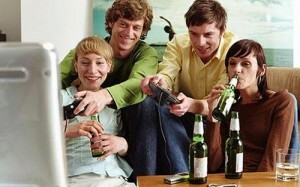 The atmosphere in a family also effects on an early appearing of alcoholism. They always present and see how their parents drink alcoholic drinks. Thus, consciously and unconsciously, a child joins to alcoholism and perceives it not as a bad habit or illness, but as a normal thing. Sometimes even necessary for life. A child, seeing the behavior of his parents, who are the most important for him, and he begins to take their behavior as an etalon, coming after and imitating their way of life. Not surprising, that in children from such families there is often observed an early alcoholism, and besides the first glass is given them exactly by mother or father. Often in such unfortunate families a child feeds bad and receives fewer vitamins, which are necessary for his full life. That’s why he can’t develop well, his immunity reduces and infectious diseases appear often. It is always pleasantly for parents to notice in children’s behavior their “own”: oh, the spitting image of dad (or mom, it depends on the situation). “The tracing” in children behavior of drunken parents is not always reason for happiness. The parents alcoholism more often makes immediate influence on children, and they suffer from this more than adults. Diseased psychological development of children is needed in adults’ intervention, because psychological “sags” in childhood can leave serious consequences for whole leftover life. In course of time a child notices, that he was used as “stabilizer”, capable to restrain parents’ appetite to alcohol. But something went wrong and “the contacts” with glass have just increased, and the relation with a child became “zero”. Or conversely, his was pestered with excessive attention. In this way, the alcoholism in child’s eyes represents reality with large refractions. It’s originally not taken as a way to chill out, as adults do thinking that they are suppress a feeling of grief by drinking and so on. Furthermore, an alcohol directly effects on a child’s mental development, what is come out actively during school years and stays for whole life. Mental deficiency, inhibited mental development of children and others consequences of family boozes – is too expansive pay for parents’ alcoholism. “Heroic nature”. A child takes upon himself a role of a parent and shoulders all the troubles, which the parents can’t deal with. “Airy-fairy”. The child like this goes away from all the troubles into an imagined world, because it is uncomfortable for him in real life. He doesn’t seek to solve problems, to get going, to develop. The mane for him is to hide. “Utmost”. A child suffers from irrational anger of drunken parents and always guilty. It can become a reason of inferiority complex, guilt, low self-esteem, it has a negative effect in a future life. “I can do everything”. Very spoiled children, which are allowed everything by their parents in order to make up for their mistakes. It is very difficult for such children to live and keep company with others, because he is not educated, not familiar with interpersonal etiquette and right behavior in community. According to statistic, children from families of alcoholics are very inclinable to celibacy and drug addiction. It is difficult for such children to get married, because they aren’t ready for social relationships and romanticize a marriage too much. As a result of unfortunate atmosphere in a family numerous complexes are developed in a child, low self-esteem, and it interfere them to adapt in future life. The attempts of a child from unfortunate family to ho hide his problems and to live a normal life are similar to coterie. Only skilled therapist or psychologist can break it and find a way out. Timely visiting a specialist can fix the situation and help alcoholics and his children to live full life.